I recently gave a presentation to my local networking group explaining how Tweet4MoreBiz, Tweet Forensics and other services worked together to help our clients gain leads to help them generate more business. I know I'm not exactly the world's greatest presenter (far too many "erms" for a start) but this short video helps explain how these elements work together and why we're not your run-of-the-mill social media management service. If you would like to know more about Tweet4MoreBiz and Tweet Forensics™ then call me on 01924 829393 / 07584 415452 for a no obligation chat! ...or to put it another way, the more followers you have have, the more likely you are to attract customers at the expense of your competitors. But does your business have a strategy to continually connect to new relevant people and grow your Twitter follower base? If not then you could be missing a trick! If you would like a friendly, free no-obligation chat about the power of Tweet for More Business and how it could work at finding more business for you then why not give us a call on 01924 829393 or 07584 415452 ? 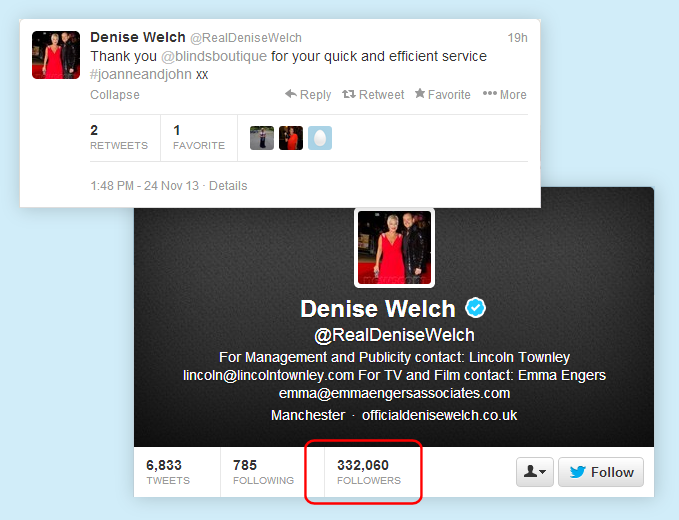 It's brilliant to see another of our "Tweet for More Business" clients being thanked by a high profile customer - this time ITV's Denise Welch has tweeted a thank you to Blinds Boutique for "their quick and efficient service" - a message that has gone out to her 330,000 followers with further retweets spreading the message even further! 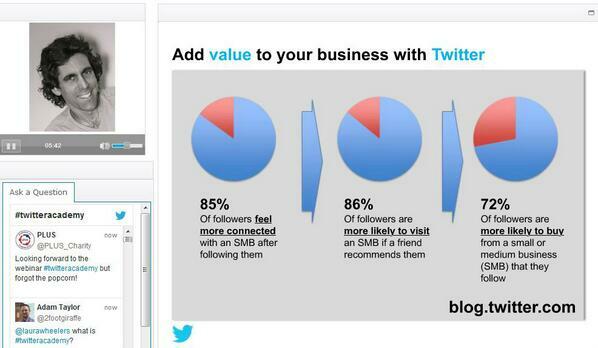 It shows that you should never underestimate the power of Twitter to boost a business! Denise Welch is well known as a regular presenter on ITV's "Loose Women". Denise also won Celebrity Big Brother last year. Her tweet thanking our client Blinds Boutique has gone to her 330,000 followers giving Blinds Boutique a fanstastic promotion! If you need some free pointers on using Twitter to promote your business then call us on 01924 829393 for a no obligation chat! 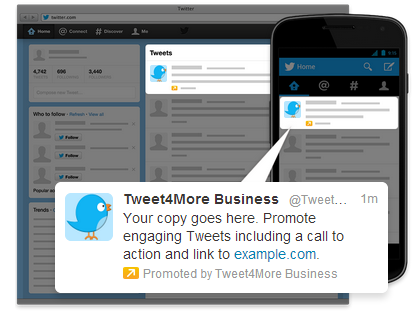 Twitter Ads (which has been available in the US since April) finally went live in the UK today. We are really excited about this as is will make a perfect complementary service to the core "Tweet for More Business" offerings for those clients with slightly larger marketing budgets. Twitter Ads works in a similar way to Google's Adwords - you provide a total campaign budget, a maximum daily spend and a bid value. Then after defining a number of parameters your account will be highlighted to people that are relevant to you. You can target people with a similar interest (ie following @accountnames), geography, by category such as "Automotive" or even "Automotive/Offroad vehicles", gender etc. 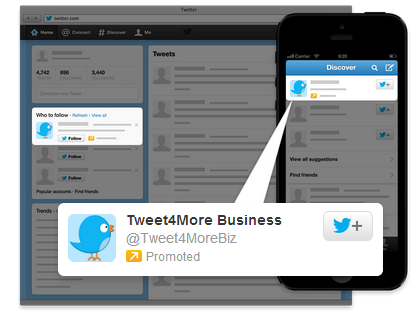 Of course there are pitfalls with Twitter Ads just in the same way as there are with Google's Adwords. The biggest problem is that without experience and carefully planning, you can quickly burn through your budget without seeing much in return for your investment. We are experts so don't waste your time guessing how to market yourself effectively on Twitter - instead call us on 01924 829393 - you can then leave it to us while you get on and run your business! To demonstrate how our Tweet for More Business service can tap into the amazing potential of Twitter, one of our client's products has appeared on national TV!! This came about because our service connected Blind Boutiques' Twitter account with an ITV researcher. Due to this connection, the researcher saw a Tweet featuring a product that was going to be perfect for a feature they were planning. The researcher then contacted Blinds Boutique to arrange everything for the shoot. This happened a few weeks ago and the article aired yesterday on ITV's This Morning" (17-September). Here is a screen shot from the programme that shows exactly how a Tweet was transformed into national TV exposure! If you can stand watching Louis Spence, you can view the feature here Spence & Son surprise a stylish student (go to around 9 minutes 20 seconds in). This shows how a Twitter account that's been turbo boosted with our service can result in exciting and unexpected opportunities! Why not call 07584 415452 and give it a go yourself?